Knitting and Crochet Blog Week: Not quite done yet! The manic posting spree is over, but there are competitions still running! Voting is open right now for the best post in the “Something a Bit Different” category, where bloggers were asked to get creative with their posting. I’m very pleased to say my Yarn Personality Test is one of the 10 finalists! So this a reminder to go check out all the amazing posts from that challenge and cast your vote here. Even you didn’t write any posts for this week, this is still one way you can get involved! It’s the last day of Knitting and Crochet Blog Week, and here I am talking about how I should do less knitting. I have also been known to sew on occasion. In fact I learnt sewing long before knitting. Just as I was getting some serious sewing chops, I discovered that knitting was way easier and more portable and didn’t require messing up half the living room. My fabric stash has lain untouched for a very long time and I don’t even have any finished sewing projects that I wear regularly (Interestingly, my yarn and fabric stashes are the same volume – one big IKEA box and a bag of scraps I like to deny the existence of). Honestly, the last time I got out my sewing machine was kind of traumatic: I had already left it aside for a year and when I unzipped the case I found a dried up little cocoon just inside the zip. “Wow I’ve not used this for a while!” I thought. Then I took the machine out of the case. There was a dead cabbage white butterfly at the bottom. Words cannot describe the strange feelings this scene evoked, about the futility of life, the regret of not sewing more and also how icky dead bugs are. Anyway the point is, I need to sew more! Nothing motivates you towards achieving your goals like declaring them for everyone to see in advance, so here are 3 sewing projects I want to “balance” (ding ding! titleword!) out my knitting with this year. I bought this dress a while ago at a vintage fair. It’s super-smart but it also has construction problems that need fixing before I can wear it. This is a Liberty lawn summer dress I started making the last time I felt the need to sew. It’s been lying around with no hems or button bands for far too long. The skirt is my first attempt at pattern-drafting and as such fits terribly. It must be ripped apart and rebuilt. Stronger, faster, and with more features. I hope you enjoyed reading my posts for this fabulous blog week! You can read everyone else’s Day 7 posts here. Today’s topic is all about levelling up your knitting-related skills. But instead of just talking smack about my mad skillz, I’m going to get proactive. You see, there is one particular unmastered skill I’ve been wilfully avoiding: Sock- darning. My first ever knitted sock took 3 years of battering before finally getting a hole in the toe. It shall sit around at the bottom of my sock pile no longer! THRILL!! As I darn a sock before your very eyes! MARVEL!! At how long it takes me to find the right colour of yarn! WONDER!! At the barely adequate results! So here is the sock and here is the hole. Luckily it’s pretty small and just caused by snagged yarn, rather than overall thinning from wear. Oh and it sits entirely inside a grey stripe. Very convenient! and the next step is to unwind the leftover sock yarn until I hit a grey run. Unfortunately Opal sock yarn has some pretty long colour runs, so 9 metres of yarn later, I finally get to some grey. Let’s face this hole head on and get to the darning. STEP 1: Horizontal running stitches. The nice easy part. Doesn’t it look neat so far? STEP 2: Vertical running stitches. These must weave in and out of the horizontal ones. Not too shabby-looking if I say so myself! The end! It’s kind of lumpy, but I think I did ok. This is definitely the most thrilling post I’ve written all week. You can read everyone else’s Day 6 posts here. Have you ever wondered to yourself “If I was a yarn, which yarn would I be?”. I just know you have! Wonder no more! 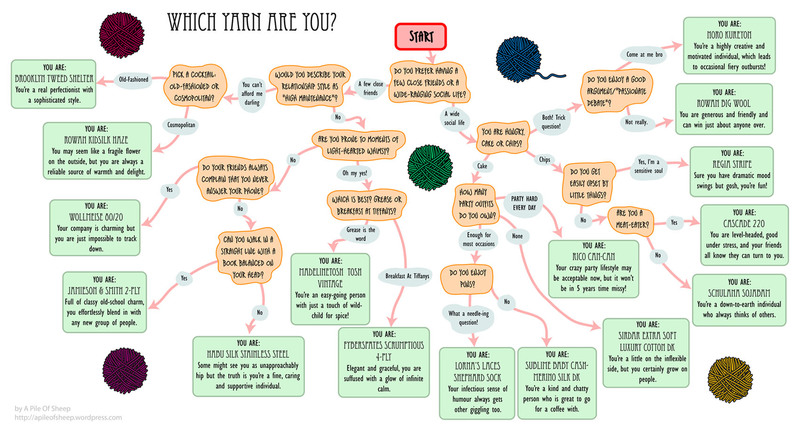 Follow my extremely accurate* Yarn Personality Test and find out! Just click the picture to see the glorious full-size version! *test may actually be inaccurate to the point of causing mild offense. You can read everyone else’s Day 5 posts here. Like all clothes designers, knitters must work one season ahead. Of course, we are bound by the speed of our needles rather than the international Fashion Weeks, but the end result is much the same. My knitting projects don’t really change significantly with the weather; I am far more influenced by fashion seasons. I have a great deal of interest in clothing construction and design, and I quite happily look to the top designers for seasonal knitting inspiration. High fashion collections often look quite unwearable (unless you make regular red carpet appearances) but they’re best thought of as concept art – collections always contain repeating themes, prints, motifs and silhouettes. High street designers try to predict which of these ideas will stick and then translate them into cheaper pieces for the public. For example: Last year lace became quite a trend. One particular Erdem dress went down very well, and got copied many times over. So I know that one way or another, catwalk trends are going to pop up in my field of vision. Then, when I start thinking about new knitting projects, I’m going to unconciously gravitate towards things I’ve recently seen. If this is the case, I’d rather get my inspiration from the skillfully crafted source, not the knock-off versions! Obviously I’m not going to spend hours/days/months of my life trying to copy fads exactly. What a waste of time that would be! But when I see collections that I like, with ideas that can be easily applied to classic, long-lasting pieces…well, I might just pick a few projects that fit in. Currently the fashion world is already looking ahead to Autumn and Winter 2012, or “Fall” as they like to euphemise. Well specifically: “Spring” is Spring, “Resort” is Summer, “Pre-Fall” is Autumn and “Fall” is Winter. Yes, it’s dumb. -I’ve seen a lot of dramatic diagonal patterns that I liked the look of. Especially the plaid skirt below, I would rock the heck out of that. Diagonal patterns could be another way to get my stripe fix too. -Fussy little prints. Obviously plastering them all over a suit is a bit OTT, but it would be so easy to work a simple little stranded colourwork pattern into some accessories or a jumper yoke. The cape is completely gorgeous as far as I’m concerned! -There’s a bit of an opera glove trend going on too. Ok, this is unlikely to become a wardrobe staple across the nation, but I like the idea of extravagant gloves in luxury yarn. It helps that there are plenty of long glove and gauntlet patterns on Ravelry already. Knitters are clearly ahead of the curve on this one. You can read everyone else’s Day 4 posts here. Instead of the Day 3 topic, “Your Knitting Hero “, I’ve decided to play the wildcard! Indulging in knitting is an easy thing to do where I live. Bristol is a city that prides itself on it’s artsiness. There are frequent yarnbombings in the centre, giant fancy yarn shops further out and a knitting group in every neighbourhood. Awesome right? I have good yarn, good company and good pubs. What else could a knitter possibly need? What am I going to fill this post up with? Well I can think of some things! I knit on my own sometimes too, and a creative activity needs a well furnished space to inspire it. Let’s fling financial concerns to the wind and make today the “Craft Your Fantasy Knitting Shopping Spree” post! Firstly, I need a chaise longue. This is a very important part of decadent lounging and knitting. No-one could possibly argue with this. Obviously it will have a knitted cushion. Secondly, good overhead lighting. I actually have a nice desk lamp with a daylight bulb already, but a floor lamp would be neat too. I find this type of bulb pretty essential if you’re knitting black wool at night. 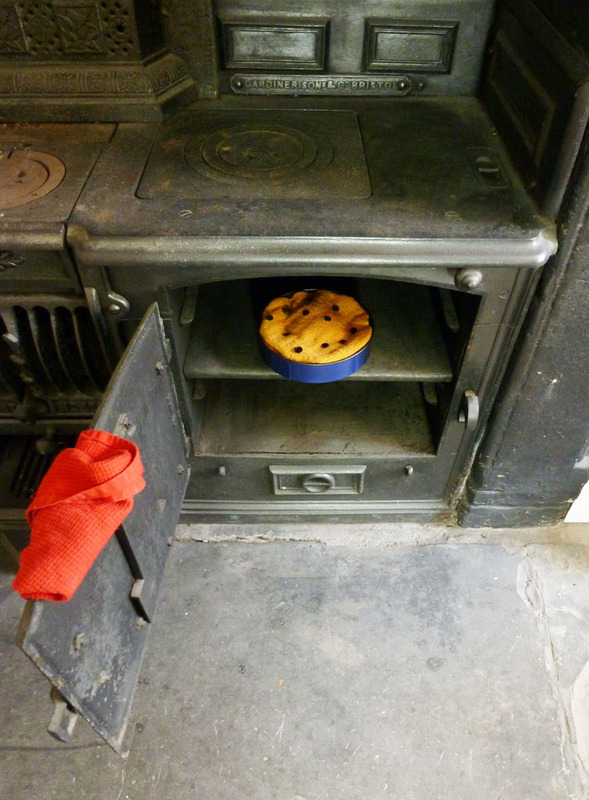 Next, a good vintage cake stand. I’m talking about the freestanding wooden type that was very specific to the Edwardian era. You can see plenty of these in antique stores and it’s a shame they went out of fashion. They’re the perfect bit of furniture to have beside a knitter: Tea at the top, cake in the middle, yarn bowl at the bottom. Bam. Well I could happily stuff all of these things into my front room but there’s still something missing – the fanciest yarn and needles I can’t afford to spend actual money on! I think for yarn it would come down to my own custom couture yarns, courtesy of Catherine Lowe, or enough Brooklyn Tweed Shelter for a big snuggly cardigan, OR mink. Yes, mink yarn exists and it’s perfectly ethical. And undeniably luxurious. The materials nerd in me also wants carbon fibre needles to knit everything up on. So there: my fantasy knitting purchases! Would you add anything to that list? You can read everyone else’s Wildcard posts here. You can read everyone else’s Day 2 posts here.